With the explosion of thrash metal in the early 80s that saw Kreator, Sodom and Destruction launch into metal legends, Germany also spawned another network of acts that were destined to remain underground. 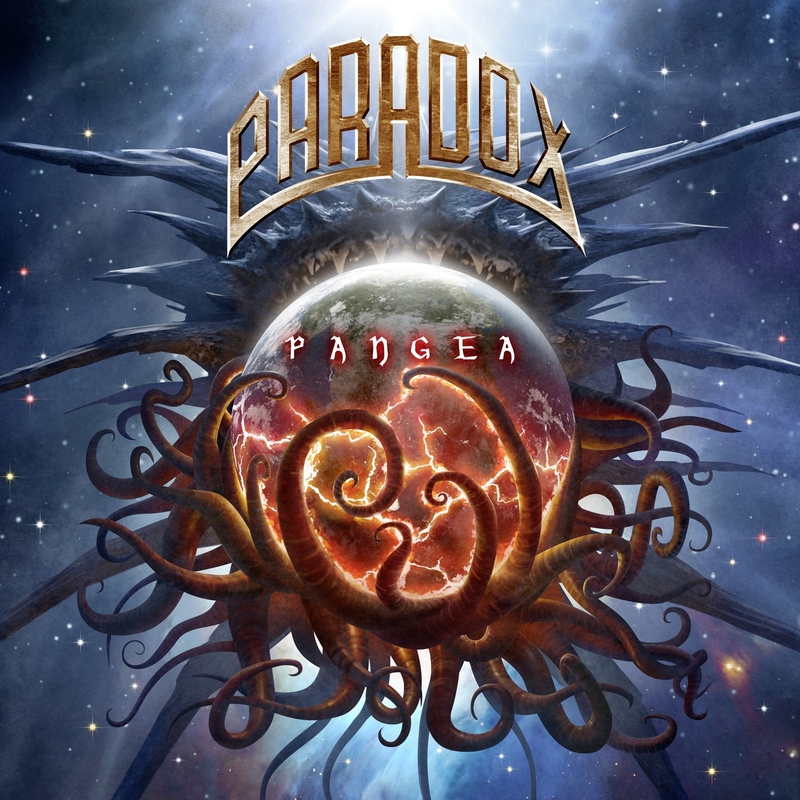 Leading the way was Paradox, led by guitarist and vocalist Charly Steinhauer, who blended the riffs from the Bay Area thrash scene with a more melodic vocal style. Their first two releases are legendary, with 1988’s Heresy being the pinnacle point of their career. Paradox are celebrating their 30th anniversary this year and are ready to release Pangea, just their seventh full length album. Reforming in 2008, they have been consistently releasing material as their sound has retained their thrash origins blended with more power metal tendencies. Back with a completely different lineup since 2012’s Tales Of The Weird, Steinhauer has surrounded himself with an incredibly talented group of musicians. Featuring members of Suicidal Angels, Blind Guardian and Sunburst, the players are incredibly diverse and experienced. Taking a year and a half to complete the songwriting, Steinhauer made sure the material was more expansive than his previous work. At times a little bloated, Pangea is about an hour long with three songs extending the seven minute mark. The mastering is also incredibly loud and is tiring on the ears after just a few songs. Steinhauer has a distinctive style to not only his vocals, but also his guitar riffing. Opener “Apophis” comes roaring out of the gates with a quick alternated picked riff after a moody intro that builds up the atmosphere. The song is a riff fest as the track is constantly evolving. “Manhunt” is the archetypical Paradox song with a ridiculously memorable chorus. At almost eight minutes, the song is given the breadth to uncover its genius. More killer riffs are laid down with an incredible solo section where Steinhauer and guitarist Gus Drax feed off of each other. Other facemelters are “Alien Godz” where Steinhauer lets his voice reach the height of his range. “Ballot Or Bullet” also moves at an extreme pace with another outstanding chorus. “Vale Of Tears” slows the pace down and finds the vocals more subdued and its success is built around the use of dynamics. Ex-Vendetta vocalist Achim ‘Daxx’ Hoemerlein was brought in to pen the lyrics. Paradox will never release an album that is on par with Heresy, but they are one of the most consistent bands playing in the genre today. Steinhauer has a penchant for writing memorable vocal lines, but his real genius are his fast precise riffs, which are destructive. Paradox are still one of the best kept secrets in metal.